BATON ROUGE, La. – Mason Jones hit a jumper in the lane to give Arkansas a 90-89 lead with 22 seconds left. The 19th-ranked LSU Tigers had three attempts to win the game but could not convert as the Razorbacks pulled out a one-point win before the 10th-largest crowd (13,311) in the Maravich Assembly Center. Arkansas let an 18-point, second-half lead slip away and LSU grabbed three, one-point leads inside the final 3:39. However, Arkansas was able to answer each time to regain the advantage. First Isaiah Joe made two free throws with 2:27 left. Second, Daniel Gafford got an offensive rebound and put-back with 3:01 left. Last was Jones’ game-winner. With 2:01 left in the game, Gafford fouled out and Ja’vonte Smart made both free throws to put LSU up one, 89-88. Neither team would score until Jones made what proved to be the game-winner with 22 seconds left. This was the second time Jones has hit a game-winner this season. In game three, he hit a free throw with two seconds left to give the Razorbacks a one-point win (73-72) over Indiana. For the second straight game, Arkansas won despite being out-rebounded by 24 (44-20). In fact, the Tigers had 19 offensive rebounds alone compared to the Razorbacks’ 20 boards for the game. Also, LSU dominated the free throw line, making 32-of-38 at the charity stripe compared to the Razorbacks’ 7-of-11. However, Arkansas shot 58.3 percent from the field and season-best 54.2 percent (13-24) from 3-point range. Arkansas forced the Tigers into 21 turnovers and held LSU to just 20.8 percent (5-24) from beyond the 3-point arc. Gafford, who scored a career-high 32 points against LSU last month, led all scorers with 23 points on 11 of-15 shooting from the field. He added eight rebounds and two blocked shots. Isaiah Joe followed with 18 points and Keyshawn Embery-Simpson tied a career-high with 16 points. Jalen Harris (11) and Jones (10) also reached double figures. Arkansas returns to Bud Walton Arena to host Vanderbilt on Tuesday (Feb. 5). Tip-off is set for 8 pm (CT) on the SEC Network. Arkansas scored the first four points of the game, but the Tigers answered with an 8-0 run. Down four, 11-7, Arkansas went on a 13-0 run to lead 20-11 at the second media time out (11:46). The run was highlighted by two 3-pointers by Keyshawn Embery-Simpson and one by Gabe Osabuohien. The Razorbacks did not surrender the lead in the first half, although LSU tied the game, 34-34, at 3:25. Four seconds later, Daniel Gafford answered with a layup and the Hogs stayed on top the rest of the half. Gabe Osabuohien had five assists in the first half. Arkansas shot 63.3 percent from the field and had 11 assists on 19 baskets made. Arkansas had its streak of making a basket prior to the halftime buzzer end despite a nice try by Keyshawn Embery-Simpson, who launched a three-quarter court try that rimmed out. The Razorbacks had made a basket prior to the halftime buzzer in each of its last three games, one by Daniel Gafford and two by Jalen Harris. Daniel Gafford, who had only made and attempted one field goal in the last to first halves (Texas Tech and Georgia combined) had a team-best 15 points on 7-of-8 shooting from the field. Keyshawn Embery-Simpson added 11 off the bench. SECOND HALF: Arkansas won despite Gabe Osabuohien, Jalen Harris and Daniel Gafford fouling out. Arkansas opened the second half with Daniel Gafford getting a steal that led to a fastbreak Isaiah Joe 3-pointer. Adrio Bailey hit his second 3-pointer of the year – and second of his career – to give Arkansas a 64-48 lead with 14:14 left. LSU went on a 7-0 run to cut a 17-ponit deficit – the largest by the Razorbacks – to 11 (66-55) with 11:42 left. However, Isaiah Joe stopped the Tigers’ momentum with a 3-pointer at 11:31. After spending four minutes on the bench with an injury, Keyshawn Embery-Simpson came on and immediately drained a 3-pointer (8:57) to give him 16 points, tying a career high. Arkansas pushed its lead back to 17, 72-55, before LSU went on a 24-9 run to make it a four-point game (81-79) with 4:55 remaining left. Jalen Harris ended the slide with a clutch 3-pointer from the left wing. LSU took its first lead since the 14:19 mark in the first half on a Naz Red dunk at the 4:14 mark of the second half. Including that basket, there were seven lead changes and three ties over the final 4:14. This the fifth consecutive time Arkansas has beaten an opponent that was ranked #19 in the AP poll. The Razorbacks are now 8-3 all-time versus #19. The win Saturday snapped a four-game losing streak versus nationally ranked opponents dating back to a loss the then #13 Tennessee in the SEC Tournament semifinals. This year, Arkansas has lost at then #3 Tennessee, at then #18 Ole Miss and at then #13 Texas Tech. 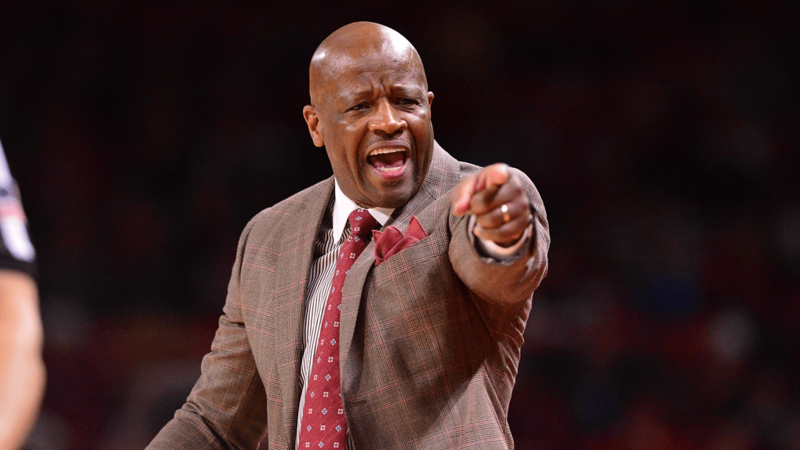 Prior to the four-game losing streak, Arkansas has won five straight versus ranked opponents. This was Arkansas’ first road win versus an AP top 25 team in nearly two years to the day. The last time it happened was defeating then #21 South Carolina (83-76) in Columbia on Feb. 15, 2017. Arkansas’ starters were Isaiah Joe (G) – Jalen Harris (G) – Mason Jones (G) – Adrio Bailey (F) – Daniel Gafford (F). This has been Arkansas’ starting lineup in 9 of its 21 games. Arkansas controlled the tip. Jalen Harris scored the first points of the game, a jumper at the elbow at 19:45. This was the 67th meeting between Arkansas and LSU. The Razorbacks own a 36-31 advantage in the all-time series, including a 32-26 advantage since joining the SEC in 1992. Gabe Osabuohien was the first sub off the bench. He has been the first sub (solo or with another) In 15 of 21 games, including six times when he was the first sub solo. Gabe Osabuohien took three charges in the game. He now leads the team with 16 charges taken this season. This was the second time a Razorback has taken three charges in a game as Isaiah Joe also had three versus UT Arlington. Gabe Osabuohien had a career-high five assists, tying for the team lead in the game. All five assists were in the first half. For the second time this season, Arkansas had five players score double figures, including Daniel Gafford (23), Isaiah Joe (18), Keyshawn Embery-Simpson (16), Jalen Harris (11) and Mason Jones (10). This was the second time this year Arkansas made a few as seven free throws, going 7-of-11. The Razorbacks were just 7-of-9 in a loss to Georgia Tech this season. This was the second time this season a team made (32) and attempted (38) 30-plus free throws. Tennessee was 35-of-39 last month. Keyshawn Embery-Simpson tied a career-high with 16 points, including 13 in the first half. Tied a career-high with four 3-pointers made. Isaiah Joe made four 3-pointers in the win to give him 73 for the season. He only needs to make 11 more 3’s to set the Arkansas freshman record. Rotnei Clarke currently owns the record with 82 in 2009. Joe, who is on pace to set the school’s single-season record for 3-pointers made, will enter the top 10 list with 12 more 3’s made as Scotty Thurman (1994) and Daryl Macon (2018) are tied for 10th currently, each with 85 makes.